Birmingham City winger David Cotterill has been ruled out of Wales' Euro 2016 qualifiers against Bosnia-Herzegovina and Andorra with a hamstring injury. 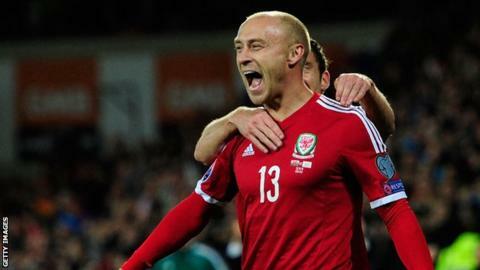 Cotterill, 27, has featured twice in the qualifiers and scored in the 2-1 win over Cyprus in October 2014. Bristol City's 20-year-old forward Wes Burns has been called up to replace Cotterill. Wales face Bosnia away on 10 October and then host Andorra the following Tuesday. Chris Coleman's team need one point to qualify for next summer's European Championship finals in France. Forward Gareth Bale is in the squad after making his comeback from a calf injury with a substitute's appearance in Real Madrid's 1-1 draw against Atletico Madrid in La Liga. Liverpool midfielder Joe Allen and Crystal Palace's Joe Ledley are included having recovered from injury. Ledley's Crystal Palace team-mate Jonathan Williams, who is currently on loan at Nottingham Forest, is also back from injury. Wolverhampton Wanderers midfielder David Edwards has been included after initially being ruled out of both games with a knee injury. Wigan midfielder Emyr Huws, on loan at Huddersfield, returns to the squad after scoring four goals in his last three games for the Terriers. Goalkeepers: Wayne Hennessey, Daniel Ward, Owain Fôn Williams. Defenders: Ashley Williams, Ben Davies, James Chester, James Collins, Chris Gunter, Neil Taylor, Ashley Richards, Adam Henley. Midfielders: Joe Allen, Aaron Ramsey, David Edwards, Andy King, Joe Ledley, Emyr Huws, Jonathan Williams, David Vaughan. Forwards: Hal Robson-Kanu, Simon Church, Wes Burns, Tom Lawrence, Sam Vokes, Gareth Bale.